In its most general sense, biological evolution refers to changes over generations in a population—changes in features of the body, mind, or behavior. The evolutionary approach attempts to explain mind and behavior in terms of biological structures and processes that have evolved over hundreds to thousands of generations. This approach assumes that species have evolved ways of responding (cognitively, emotionally, and behaviorally) to environmental events because these responses led to greater survival and reproductive success in ancestral populations. To take one example, the human spinal cord develops in such a way that it can rapidly process sensory information related to the temperature of objects. When we touch an object that is very hot, the spinal cord immediately activates a reflexive response that rapidly pulls the finger away from the object. Because this response occurs automatically, we can’t explain it as the result of conscious choice. In fact, the hand typically is jerked away before the information reaches the cerebral cortex (activity in the cortex is necessary for the conscious perception of pain). The existence of this spinal-cord reflex may be explained as the product of evolution: individuals that quickly pulled a body part away from painful stimuli were more likely to survive and, hence, reproduce because this proto-reflex prevented severe bodily damage. This explanation asserts that evolutionary changes in spinal-cord reflexes were caused by natural selection. Evolution refers specifically to changes in the frequencies of variants of a characteristic (biological, psychological, or behavioral) over generations. A characteristic is a feature of an individual, such as eye color, that can be distinguished from other features, such as hair color. Characteristics often have variants that involve observable individual differences. For example, eye color has many variants, such as shades of brown, green, gray, and blue. Hair color also has many variants, such as shades of black, brown, red, and blonde. We will refer to such variants as expressions of the characteristic. Evolution, therefore, is a change over generations in the frequencies of expressions of a characteristic within a population of organisms. An analogous way of saying this is evolution is a change over generations in the average expression of a characteristic within a population of organisms. For example, a population consisting of 99% brown-eyed individuals and 1% blue-eyed individuals may evolve over generations into a population consisting of 1% brown-eyed individuals and 99% blue-eyed individuals. The average expression of eye color in this population evolved from brown to blue. What causes evolution to occur in populations? For two decades beginning in 1836, Charles Darwin developed a credible naturalistic theory able to explain evolutionary changes — a theory that he began to develop when trying to interpret observations he had made during his five-year voyage on the H.M.S. Beagle (Darwin, 1839), as well as in research that he and others performed during the 23 years after Darwin returned from that voyage. This was the theory of evolution by natural selection. He published a detailed description of the theory in the first edition of the book, On the Origin of Species (Darwin, 1859; the sixth edition generally is considered to represent Darwin’s mature views on evolution and its causes.) No one before Darwin had so masterfully marshaled such an enormous amount of supporting evidence for the evolution of organisms. In addition, no one before Darwin had outlined such a compelling explanation of evolution: natural selection. Natural selection may be defined as the increased reproductive success of individuals with particular expressions of physical, mental, and/or behavioral characteristics. To put it most simply, Darwin argued that natural selection occurs when a subset of individuals in a population produce a greater number of offspring, on average, than others because they express a physical, mental, or behavioral variant that allows them to adapt better to their environments. Let’s consider, for example, a fictional species of fruit fly that has just arrived on a windy and tiny island hundreds of miles from any other land. 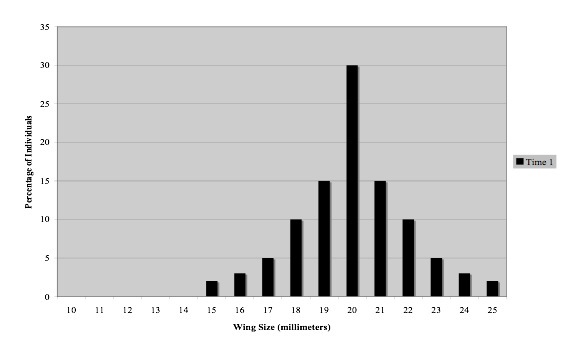 And let’s say that, in this founding population, there exists a a broad range of individual differences in wing size, as shown in the following graph. As can be seen in the graph, some individuals have large wings, which are advantageous for flying speed and for the ability to stay airborne, whereas others have small wings, which result in slower flying speeds and greater difficulties with staying airborne. On this small and windy island, larger-winged flies probably would be more likely to get blown out to sea, whereas the smaller-winged flies would be less likely to suffer that fate. Thus, smaller-winged flies would be more likely to survive long enough to reproduce than larger-winged flies. This fictional example illustrates well the simple idea behind natural selection: individuals differ in their reproductive success because they have variants of characteristics associated with the ability to adapt to local environmental conditions. Because individuals with particular variants adapt better relative to individuals with other variants, the former survive longer, on average, and, hence, have more opportunities to reproduce. In other words, the local environmental conditions consist of factors that impose biological, psychological, and behavioral demands on organisms. These factors “naturally select” those organisms best able to deal with the environmental demands: they survive longer and reproduce more than others in their local population. There must be individual differences in the expression of the characteristic. These individual differences must be associated with genetic differences. The increased reproductive success of individuals with particular expressions of the characteristic must remain stable over generations. The first requirement has already been discussed (see Figure 1). The second requirement involves the existence of genetic variants that affect the development of characteristics. A gene is the basic unit of biological heredity. Genes consist of sequences of chemical units (sections of DNA molecules) that are contained in chromosomes carried by the sperm of males and the ova (eggs) of females. In human reproductive cells (sperm and ova), there are 23 chromosomes, which together contain about 22,000 genes (Pertea & Salzberg, 2010). This means that, on average, each human chromosome contains about 1000 genes. Thus, in our simplified example, eye color is determined by interactions among variants of three genes. The actual situation is much more complex: there are other genes as well as environmental factors that produce the many shades of eye color we see in real life. The next post will look more closely at natural selection at the level of genes.